You can overcome the mountains in your mind that blind you from seeing the beautiful landscape beyond them only by climbing the tall mountains on this earth. Here is an inspirational lady who has done it many times and shares her lessons with us. The interest of photography took her close to a place where her dreams float today. At 13, Ishani Sawant was taken to the mighty Himalayas by her uncle Prasad for her passion of photography. Here, she was awestruck by the stunning landscapes and that trek ignited in her the passion of mountaineering after which her life turned to have endless adventures. Today, Ishani Sawant, 23, stands tall with 11 Himalayan treks and expeditions in Himachal, Uttarakhand, Sikkim, Ladakh and Nepal. Mountaineering expeditions in Himalayas and Sahyadris are generally done in traditional way where a climber has a huge support team so that he can focus upon mere climbing without worrying about cooking food, establishing camps, taking the load up the mountain and other communications. Another way is guided expeditions where climbers are guided up the peak, their campsite and food is ready before they arrive at the camp, schedule is fixed months in advance and they just have to climb behind the Sherpa. Influenced by friends Karn Kowshik, Kunal Bedarkar and Gopal Bodh, Ishani and her friend Prerna chose Alpine style of mountaineering. Alpine style is based on self-sufficiency, self-dependency and giving 100% along with being technically sound, aware of the constantly changing weather, terrain, having knowledge of how the body functions at high-altitude in extreme conditions where the oxygen becomes rare, digestion slows, and behaviour turns irritating. One has to maintain the temperament and resist being affected by any of the hardships and look at greater picture of success. “The greatest challenge was doing it in alpine style, which means no support team, no kitchen staff or porters. We ourselves had to carry our gear and equipment weighing 10kgs plus, cook our own food and pitch our own tent up the peak, decide our own schedule and plan and execute by ourselves,” narrates Ishani who stood 6th this year in IMF National Bouldering Climbing Competition. While on an expedition from Himachal to Ladakh, Ishani had to skip the two usual intermediate camps due to money inconvenience as all her savings had been consumed in a failed expedition due to extreme weather conditions which were results of Uttarkashi flash floods. “The greatest obstacle faced by almost every mountaineer or any adventure athlete is funding,” says Ishani. Starting from Leh town, Ishani and Prerna reached the base camp in just 10 hours with the help of planning from their friend Salil Pradhan who also told them about Stok Kangri and motivated them to finish it in two days. They trekked with Archit and Megan of Geck and Co-Adventures accompanied them from Himachal to Ladakh through remote Parang-La and Changthang Plateau. It was by noon that they had reached the basecamp and were ready to attempt the summit the next morning. “Stok Kangri basecamp was like a world-village where although the season had not started, there were colourful tents pitched everywhere. Foreigners from numerous countries were out of their tents for evening stroll when we reached there. The other guides and trekkers were looking at us in awe because we carried such big bag-packs. We marched towards them and conveyed about our plans and how we came up which made them very happy for us and I could see the respect in their eyes,” she expresses. Mountaineering is an awe-inspiring sport and a true test of one’s courage and mettle. With every climb one needs to push, it teaches the lessons of commitment, focus and humility like nothing else in this world does. One small mistake on a tough route can be quite fatal. So, each time a climber has to be prepared and never can the climber afford to be callous or careless but has to always stay alert and aware, and not to mention, respect the mountains. “Nothing matters on the mountains; there are no appointments, no deadlines, there is nothing other than you and the relationship you have with the mountain,” says Ishani. While Ishani agrees on the risk factor being unimaginable and beyond regular capacities at most times, she is more attracted to the sense of satisfaction and peace one gets which is immensely fulfilling and she pushes herself towards her attraction. Next morning at 11am Ishani and her friend started climbing and the weather started to worsen. “We thought of going back down to the basecamp but just sat down, ate chocolates and continued up,” she mentions. They reached the summit at 1pm and stayed there for an hour admiring the beauty of nature and the sight of amazing Nun Kun, Kang Yatste and Gopal Kangri peaks visible from the summit and they soon realised that the weather was getting worse and began to descend. On descending they were greeted with a blizzard. Battling against sharp snow molecules assaulting their faces and eyes for 3 hours they descended in the soft snow, where the feet would go as deep as knee on every step. “On the way down, I met my climbing mates Nihar and Major Kartik from the Indian Navy Team who were utterly amazed at us. They saw how the peak had bad weather, and wouldn’t imagine climbing in that condition themselves. We felt proud! By night we were in Stok village where on seeing our mentor Salil, the tiredness disappeared. We owe our success to him,” she expresses. She learnt that if one shows commitment and dedication then people around automatically begin to develop respect. “At no point should you take favours; you need to prove your stand by doing everything yourself no matter what,” says Ishani who aims to promote adventure sports amongst the masses and the tremendous life-lessons that it teaches. Having faced rejections from family, friends and relatives, Ishani has fought it all by showing her dedication. She believes that in India, girls do not get the respect and support they deserve, especially, from male counterparts and that serves as the major reason why there are very few girls in adventure sports. Now, she is working as an adventure and outdoor educator- trainer and guides and manages as a coordinator various outdoor adventures and events. However, the men she trained with, namely, Vikas Satarkar, Tuhin, Dhawal, Ganesh and Vikram have been very supportive, and Ishani was always looked upon as a member with the same strength as them and had no privileges. “If the guys did 50 pull-ups so would I. Every time I would train as hard as they would. 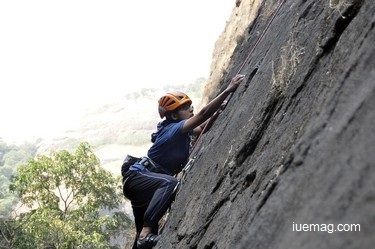 So, whenever I would go outdoors with them, they always considered me as one of them and this helped in a big way,” says Ishani Sawant, a law student who has a deep knowledge and understanding about the technicalities of adventure and sports. Having done many photography shoots for rock-climbing and having assisted in international Kayaking festival shoot which requires hanging on the rope for hours to click action pictures, Ishani feels it’s a dream worth following and aims to make a good career as an adventure athlete. The only sad part in adventures is its expensiveness and the challenge to source funding; only when the funds are acquired can the dreams be lived.